It's the first week of the month, so you know what that means - etiquette time! 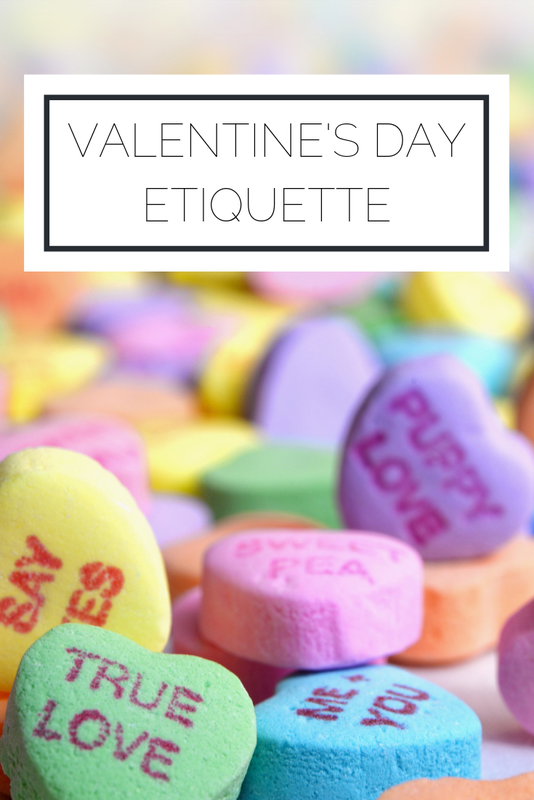 With Valentine's day coming up next week, I thought it would be fun to talk about the etiquette of this lovely holiday. I wrote about this originally back in 2015 (you can check out the post here) and thought it would be the perfect time to bring it back. For many, Valentine’s Day can potentially be a sore subject. Whether someone just went through a breakup, can’t find a date, or just isn’t a fan of the holiday, be aware of who you’re talking to. Don’t brag about the romantic evening your boyfriend planned for you and generally assume that less is more when it comes to sharing. Also, don’t be negative and go on about how Valentine’s Day is just a Hallmark holiday designed to trap consumers into spending; this may be true, but it may simultaneously be true that your friend is excited to celebrate with her significant other and your comments aren’t appreciated. If you and your girlfriends are going to have a Galentine’s Day bring little treats for everyone, such as cards saying why you love having them as friends. Or, pay attention to what your boyfriend has been talking about lately and get him a gift that will show you care. Putting forth extra effort will be appreciated, but doesn’t need to drain your bank account. Have decorum when it comes to getting dressed for the big night. As tempting as it is to pull out your sexiest dress and heels, remember that it is February and cold! You can always be more revealing in private. When it comes to relationships we all know that communicating is important, so make sure to discuss your expectations of the day beforehand. Are you going extravagant or low key? Gifts or not? This will make it far less likely that you will end up disappointed. Going along with being prepared with your expectations, you should also be realistic. If you’ve just started seeing someone it is unlikely that he will pull out all of the stops to make this the most romantic night of your life. Likewise, you should take care not to put pressure on the person you are spending the day with or make him feel badly if there isn’t a Noah and Allie moment. Valentine’s Day, for all its romance and hype, is a day for you to share love! Be appreciative of everyone in your life and make sure they know it. What are you doing to celebrate Valentine's Day? Hope it's filled with lots of love. Check out more of my relationship posts here.